For over eight years we’ve been working closely with estate and letting agents, banks, building societies, house builders and housing associations to help them welcome their customers to their new home. With over 800,000 gift boxes delivered so far, that means we’ve served over 8 million cups of tea and 16 million biscuits to weary home movers! 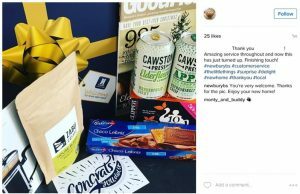 Our customers receive some great feedback from their home movers, often seeing a daily stream of thank you messages and photos on social media. 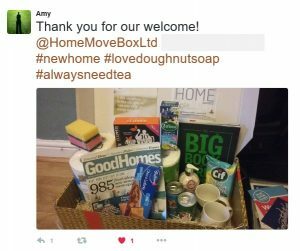 Here are just a few of the fantastic posts and tweets our customers have seen on social media in response to their boxes. This can really help to drive awareness and recommendation amongst relevant audiences, whilst demonstrating that great, personal, customer service is at the heart of your brand. One of our campaigns recently generated a potential social media reach of over 80,000. 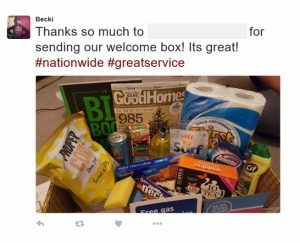 We’ve even seen one single tweet of a customer’s gift box reach over 3 million Twitter followers.